Parents should be stopped from parking outside schools with their engines running when they pick up and drop off their children, health chiefs warn. Cars near the school gates are damaging children’s health, according to Public Health England which is urging councils to impose tough measures on polluting vehicles. 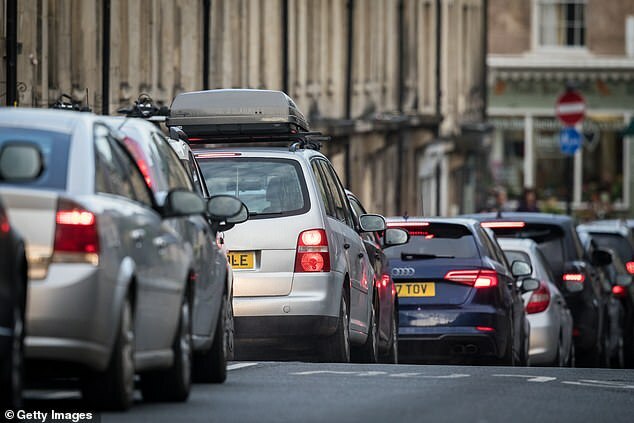 Congestion charges, bans on cars around schools, lorry bans in city centres and electric car priority parking are being proposed by the agency. Air pollution is thought to kill up to 36,000 people per year and can lead to breathing problems, lung cancer and heart attacks. Fines for running engines outside schools have been recommended by the NHS watchdog, the National Institute for Health and Care Excellence (NICE). Another measure being proposed is congestion charges in cities, but these are dependent on local authorities putting them in place. Professor Cosford said: ‘We know that local councils are wanting to do this. In Public Health England’s review it suggests local councils take more action on reducing pollution and creating healthier environments for their residents. Encouraging people to drive low-emission vehicles, such as hybrids and electric cars, and investing more in ‘clean’ public transport should be priorities, it said. And they should create more footpaths and cycle lanes, use planning powers to move homes and schools away from polluting roads, and have low emission zones. ‘The evidence is overwhelming,’ said Jacob West, the British Heart Foundation’s director of healthcare innovation. ‘Air pollution poses a serious threat to the nation’s health, causing thousands of heart attacks and strokes each year. ‘This report provides much-needed guidance on the best ways to improve air quality across the UK.